Before we start: today marks the 148th anniversary of the founding of the U.S. Navy Medical Corps, in which physicians automatically receive Commissions as naval officers. Prior to that time, doctors received their Commissions from individual ship commanders as they saw fit. Now, back to our original program. In medicine, as in naval operations, the least dramatic undertakings often produce the most dramatic results. Look, for instance, at convoy operations in both World War I and World War II. Despite devastating losses due to submarine attacks on merchant shipping (Britain was only months from suing for peace in World War I due to impending starvation), senior naval officers resisted the use of convoys protected by antisubmarine-enabled escorts, because such prosaic (and both boring and dangerous) work didn’t fit the idea of dashing naval battles. Yet when the convoy system was instituted, in each war, merchant ship losses plummeted. The story is similar in medicine. It is almost cliché to say that non-combat deaths (from contagion and, interestingly, scurvy) in land war exceeded combat deaths until the Franco-Prussian War (1871), when German attention to hygiene – and vaccination against smallpox – reversed this proportion for the first time in history. This relation held (with the notable exception of the American experience in the Spanish American War) through both World Wars, the Korean War and Vietnam. Only in the recent wars in the Middle East and Afghanistan have advanced combat casualty care and the wide use of body armor brought the proportion of combat to non-combat deaths to near parity, with accidents, not disease causing the largest number of non-combat deaths. I’m soon to be giving a talk on what I thought would be mostly about combat casualty care – the surgeons’ work in the cockpit – in Nelson’s navy around the time of Trafalgar. As I began to research the matter, it became pretty clear, pretty quickly, that the most significant benefits from the Royal Navy’s medical establishment in the quarter century leading up to that battle were the most pedestrian imaginable, and most definitely not dramatic advances in the surgical art. Pushed by naval physicians and surgeons, and some enlightened line officers, the Royal Navy reformed its victualling to include regular supplies of sauerkraut (a fair source of vitamin C), fresh vegetables whenever possible, and citrus fruits and juices. This reduced the incidence of scurvy to almost non-existent. Surgeons and commanding officers began to demand cleanliness among the sailors (a general issue of soap to ships of the fleet was instituted only after 1795), their clothing and bedding, and of cooking and eating utensils. This reduced the incidence of fever and the fluxes* significantly. –“flux” and “bloody flux” – gastroenteritis or dysentery – caused by a variety of bacteria that grow in spoiled food and unclean cooking and eating utensils. (1) Care is warranted in noting these numbers, as naval operations during the American Revolution ranged from the tropical Caribbean to Newfoundland. In the later period, most battles occurred in the northern latitudes. Nevertheless, the beneficial effects of good nutrition and basic cleanliness were significant. This post is based on preliminary research for my lecture project and are drawn from the classic and epic four volume medical history of the Royal Navy started by John J Keevil (Vols 1 & 2), and, following his untimely death in his mid-50s, completed by Christopher Lloyd and Jack Coulter. The material that informed this post is in: Lloyd, Christopher and Jack L. S. Coulter, Medicine and the Navy, 1200-1900, Volume III 1714-1815. London, Livingstone, 1961. Several more sources await my attention. Around mid-January, there was a flutter of news that the Spanish frigate ESPS Méndez Núñez (F-104) was in Norfolk and will be integrated into the USS Abraham Lincoln (CVN-72) Carrier Strike Group until November of this year. A review of the ship’s history on Wikipedia shows that since her commissioning in 2006, she has been quite active in international anti-terrorism and anti-piratical activities. What’s medically interesting about the ship (which, according to an article in USNI News, is being showcased by Spanish shipbuider Navantia to the U.S. Navy, presumably as a possible candidate for its FF(X) future frigate program) is that it has what looks to be a basic surgical suite instead of a simple sick bay. The ship also has a separate space to accommodate four sick or injured sailors. She typically carries a physician and a nurse when deployed, according to the USNI News article. 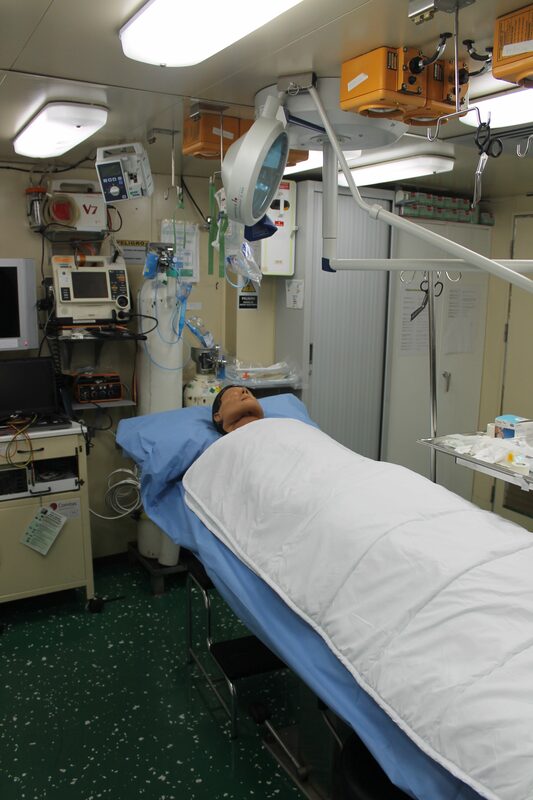 This kind of medical space is pretty unusual in a small unit like a Frigate. I recall that the sickbay in my Adams Class guided missile destroyer – I was the staff medical officer for Destroyer Squadron 15 – was no larger than a large closet. Sure, one could evaluate sick sailors there (physical diagnosis only; no Xray or lab) and perhaps do minor surgical procedures such as suturing wounds or draining abscesses, but there was no room to do something as basic as an appendectomy (the crew’s mess deck, a much larger space, could be fitted out for surgery, but this was intended for combat casualty care, and doing even simple appendectomies was officially discouraged). Most U.S. small units don’t rate medical officers unless they are squadron flagships (and I’m not sure even these ships rate a physician these days). Independent duty corpsmen, specially trained to be the sole “Medical Department Representative” serve on these smaller ships, and have proven to be most capable for tending to the minor surgical and medical needs of the crew. 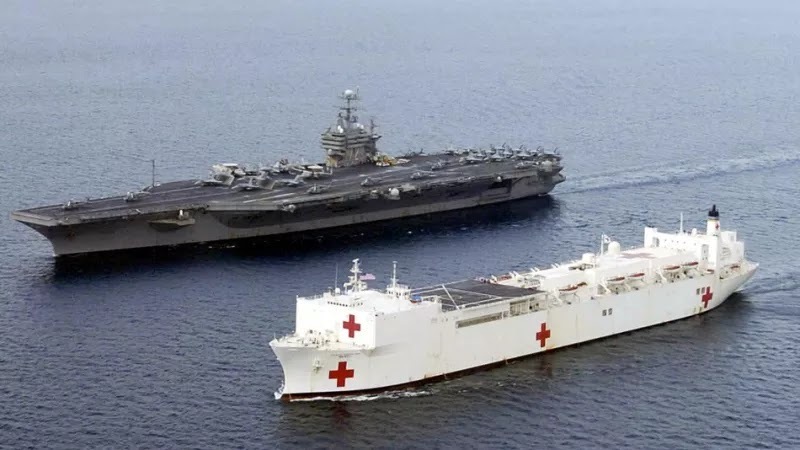 Sailors with more serious problems are typically medically evacuated to an amphibious ship, aircraft carrier, hospital ship (all of which carry qualified surgeons, or would in a potential combat situation) or a facility ashore. So I’m not sure the operating room in Méndez Núñez would be all that useful. Surely, for instance, there is no way laparoscopic work (the clear trend in abdominal and chest surgery not related to trauma) could be performed in that space. It would be interesting to learn what the Spanish experience has been. It’s not so often that we see a military medico publicly recognized for life sustaining work in combat. “It’s our job, after all” would be a common rejoinder. It was good, therefore, to read about Royal Navy Surgeon Captain Rick Jolly, who was named OBE for his surgical and leadership exertions in the Falkland War. Jolly recently passed over the bar at age 71. At the time, he was the senior medical officer of 3 Commando Brigade. He and his crew set up a field hospital in an abandoned slaughterhouse at Ajax Bay. There, Jolly and his colleagues treated more than 500 British wounded soldiers and Marines, and about 200 Argentine troops. Only 3 of those wounded died, none while under his care. The Argentine government awarded him the Orden de Mayo for his work. I remember reading that Argentine surgeons often mismanaged soldiers’ wounds, which, under typically filthy combat situations, were grossly contaminated with dirt, clothing fragments and shrapnel. Already loaded with bacteria, these wounds became terribly infected, so when the Brit surgeons “inherited” the patients, their work was often that of managing these serious infections – truly life-saving work. Jolly was an outspoken guy. See his interesting comments (and facial expressions) in a two-segment (~4 mins each) interview for Sky News here. I like this quote: “We had only one motto in War – that the wounded MUST survive”. Military medicine at its simple best.